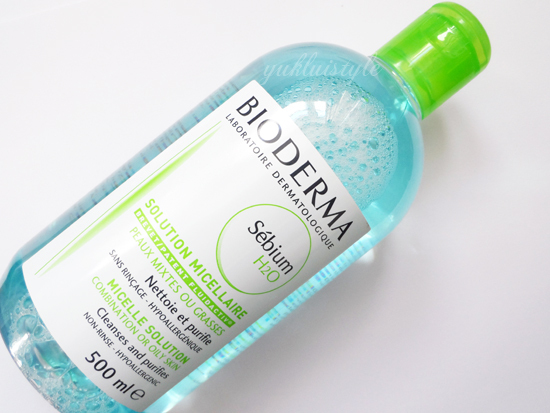 Here is the other solution Bioderma has to suit another specific skin type. I have purchased this whilst in Paris however you can purchase it at www.escentual.com if you’re in the UK. They’re based in Cardiff so no ridiculous shipping charges. They also ship worldwide at amazing prices! Whilst the Sensibio is for sensitive skin, Sebium is for combination or oily skin. If I’m too tired or in a hurry, I would use this to cleanse my face then apply moisturiser afterwards. I could see the oil and dirt on the cotton pad and it makes me feel like it has cleaned my face well after removing this. However I did find that it had left my skin drying and tight. It’s a bit harsh on me. Didn’t leave any residue afterwards. It removes makeup as well as the Sensibio however I wouldn’t use it around my eye area for the reasons said above. It hasn’t broken me out which is good and hasn’t gotten rid of any spots. Just kept them at ba without irritating them. I would recommend this if your skin is really oily. If it’s just oily or combination, it might be a bit harsh for you. I’m unsure as to whether I would repurchase. Think I’ll have to carry on using it more to see if there are any further improvements before coming to a point where it may be too harsh for my skin if possible. Previous Post Is That You Spring? Has it got any benefits specific to us oily lasses? Are any of the sebium products good for us oily girls? I have the normal one but this seems like it is more for my skin type!